With beauty products taking up a vast amount of my storage space, I have found it extremely satisfying and rather detoxifying to finish up a handful of beauty products! I have been trying to make my way through my beauty stash and use up the products I already own, before going out and buying something else (as I will admit, I probably have enough body butter, shower gel and face masks for myself, sally, dolly, polly and molly!). 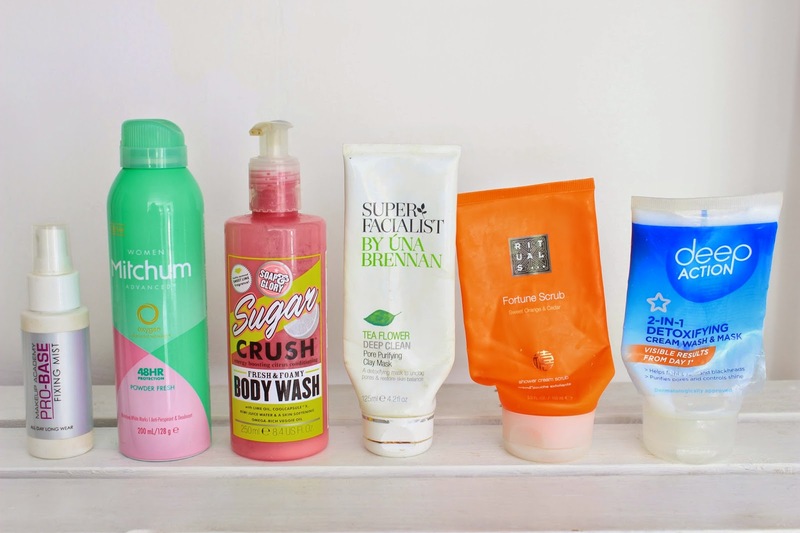 So today I have a beauty product empties post for you! And now I can finally chuck away all of the above and start collecting what is effectively my rubbish all over again, for my next empties post! I ran out of my much loved MAC Fix+ and thought I would give MUA’s version a go and I wasn’t disappointed. I must say that in terms of keeping your makeup in place this spray does pretty well, it defiantly gives MAC a run for its money. It doesn’t break the bank and didn’t dry out my skin. Word of caution though, if you use too much, your makeup will run off your face and go patchy. 1-2 sprays is plenty! I’m undecided whether to buy this one again or return to a MAC counter! I get through cans and cans of deodorant and I must say I’m not a loyal brand user and buy whatever is on offer! And this time round I opted for Mitchum Advanced Women Powder Fresh 48hr Protection Anti-Perspirant & Deodorant and I must say I the brand I had heard so much about didn’t live up to my expectations! As an anti-perspirant it did the trick, but as a deodorant I’m not so sure! I’m not a smelly individual, but this deodorant smelt funky. I have since switched to something else! The sugar crush range from Soap & Glory smells simply divine. I’m obsessed with the body butter and now obsessed with the body wash! This body wash has the most intoxicating citrus scent! It can be used in the shower and bath. You only need a couple of pumps and it is so moisturising. I was a little sad when this bottle ran out. And I will certainly be running back to Boots to pick up another! This quick fix clay mask has been featured a handful of times here on British Beauty Addict. Undoubtedly the best clay mask on the hughstreet! Highly recommend. Read the full review here. Is it just me or are magazines upping their game when it comes to ‘freebies’? This cream scrub came free in a magazine a few months back and it went straight into my bathroom. The gentle exfoliant smells a little zesty, but isn’t in the same league as Soap & Glory’s Sugar Crush range, it is more subtle and you could say a little more luxurious. I enjoyed using the scrub and would consider buying it, however I have a few others I need to make my way through first! Another product that has worked wonders for my skin. It didn’t take me long to head back out to the shops and repurchase this bargain of a face wash! Read the full review here. Do you collect your empties?